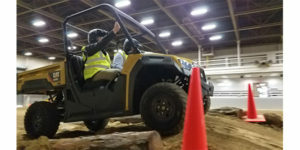 Caterpillar has taken the wraps off its first-ever Cat utility vehicles – the gasoline-powered Cat CUV82 and diesel-powered CUV102D – at the company’s high-tech proving grounds in Peoria, IL, that featured two indoor arenas for demonstrations and testing. When we arrived at the Edwards Demonstration and Learning Center in the morning for press ride and drives, Cat started off the meeting with a mandatory safety briefing. To say they are thorough is an understatement, the presentation lasted for almost 20 minutes and covered everything from where to go in case of a tornado to where the bathrooms were located in each building and who to call in case of an emergency (Cat assigns a representative to call 911)! Safety is paramount to how the company does business. 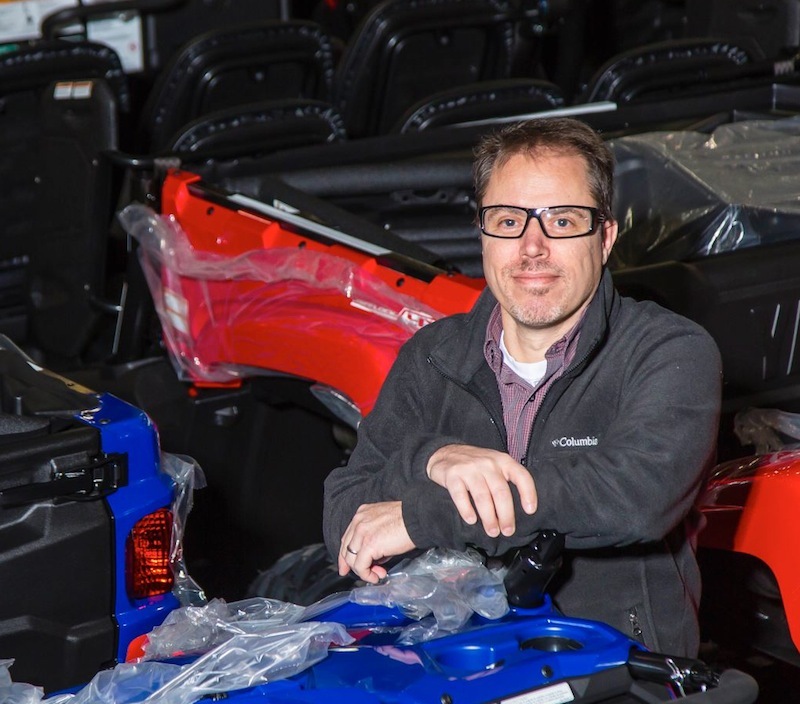 Beginning with a clean sheet design, the company says it gathered extensive customer and dealer input to build a UTV that would meet their expectations and deliver on the its mission to build tough, durable vehicles. Cat performed rigorous testing on both utility vehicles to meet their quality standards. The CUV82 and CUV102D feature a rugged steel cargo bed and offer 1,000-pound total rear cargo capacity and 2,000-pound towing capacity for performance in a variety of applications. The UTVs boast a four-wheel independent suspension system with a front sway bar to provide unmatched stability at full load. A long swing-arm suspension, custom-tuned springs and shocks deliver a balance between a smooth ride and hauling loads. Ample ground clearance ensures these vehicles navigate rough terrain with ease. These new Cat UTVs efficiently complete hauling tasks, quickly maneuvering over rugged terrain at the worksite at speeds reaching 45 mph, depending on model. The CUV82 is powered by a Chery 0.8L three-cylinder gasoline engine delivering 50 hp, while a 1.0L three-cylinder diesel engine delivers 25 hp power to the CUV102D. Cat UTVs are built for quiet and comfortable operation all day long. The design minimizes noise and vibration during operation for a quieter ride. The CUV82 and CUV102D comfortably seat two riders side-by-side with ample leg, elbow and head room for tall riders. Customers can customize their UTVs to meet specific work needs through more than 50 accessory options. Multiple cab options with sealed surfaces on the ROPS structure provide a weather-tight enclosure, while other offerings include snow plows, heater, front winch and power dump. Cat UTVs are prewired for quick do-it-yourself installation of all options. Easy-access service points simplify vehicle maintenance, while on-board advanced diagnostics reduce troubleshooting time. The new CUV82 and CUV102D UTVs will be backed by the company’s service and support from participating dealers. These UTV models will be available throughout the United States and Canada (except Quebec) in Summer of 2018. The company says that the UTVs will also be made available in its rental fleet. The vehicles are being manufactured in Thief River, MN, at the Textron Plant (formerly Arctic Cat). Textron co-developed the UTVs along with Cat engineering, so they are not a rebranded vehicle but will be manufactured with an experienced UTV manufacturer to Cat’s requirements. Cat says the impetus to build a UTV came from customers and dealers who begged them to build one. Look for job sites to swap pickup trucks for heavy-duty Cat UTVs in the future. As job sites are increasingly more crowded with equipment, these vehicles can reduce the footprint and liability for contractors, farmers and working ranches. And if your customer wants to take it out on the weekend for a hunting trip, it’ll be more than capable. While these units won’t hit the traditional powersports channel (only participating Cat dealers), powersports dealers may look for units to be available down the road or through pre-owned channels.